Chilly weather has reached the housing market: National home values still lag 6.8 percent below their pre-recession peak. While appreciation rose aggressively coming out of the recession — and it varies widely across the country — it has recently slowed to a more normal rate. Housing inventory is still low, and the demand is driving the recent increase in home values. Though more potential buyers are forming households in the recovering economy, don’t expect a dramatic rise in home sales over the next few months. This winter season might be the ideal time to get a jump on your listing strategies. Zillow’s experts say 2016 will be all about housing affordability, with young and first-time buyers pushed out to the suburbs by the lack of affordable homes near city centers. Check out these five 2016 housing market predictions and get ready for the year ahead. It should be pretty clear by now that millennials want to purchase homes. The habits of this cohort of young adults — born between the early 1980s and the early 2000s — and other first-time home buyers are a notable departure from the Gen Xers and baby boomers, especially when it comes to housing. The most recent Zillow data shows that millennials have conservative views of homeownership. Millennials (18-34) have conservative views on homeownership. However, low interest rates and affordable mortgage payments are encouraging, and skyrocketing rents are compelling motivation for them to make a change in their housing situation. 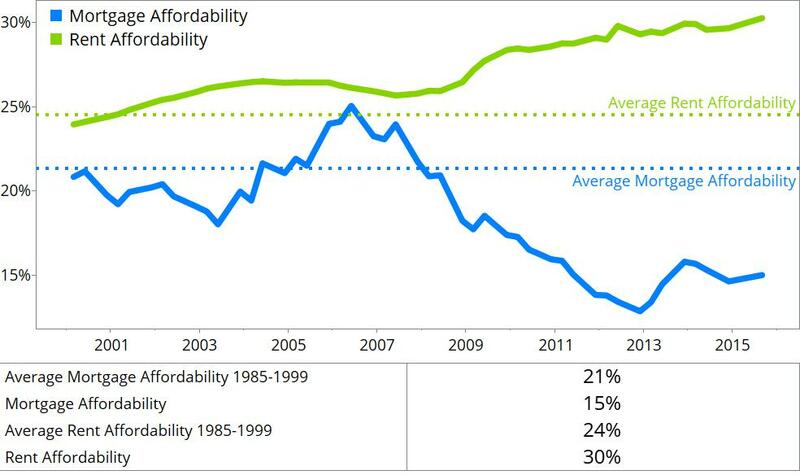 Rent has become increasingly unaffordable. The question isn’t “Why don’t millennials want to buy a home?” It’s “When and what can they afford to buy?” It’s up to you to help them answer that. The issue facing millennials and other first-time home buyers is whether it’s more economical to continue renting or to make the leap and purchase a home. To help determine that, renters need to identify their breakeven horizon — the number of years they will need to own and live in a home until it becomes more financially advantageous than renting the same home. 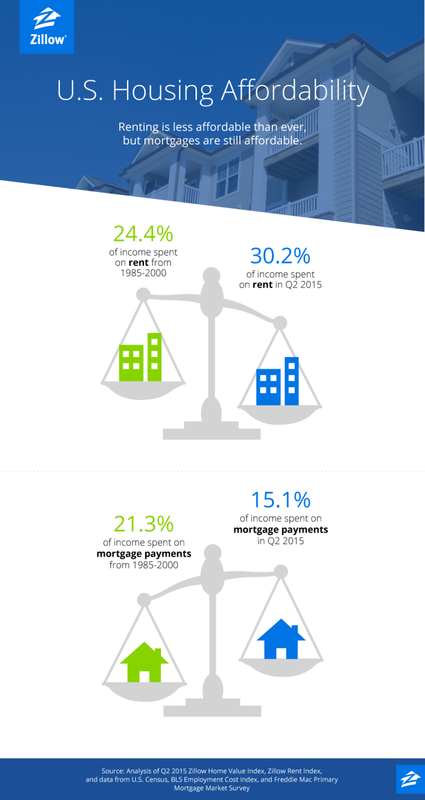 Current renters spend roughly 30 percent of their household income on housing; home buyers spend about 15 percent of their monthly income on a mortgage payment for a typical home. Spending a bigger piece of the income pie on rent makes it hard to save for a down payment. 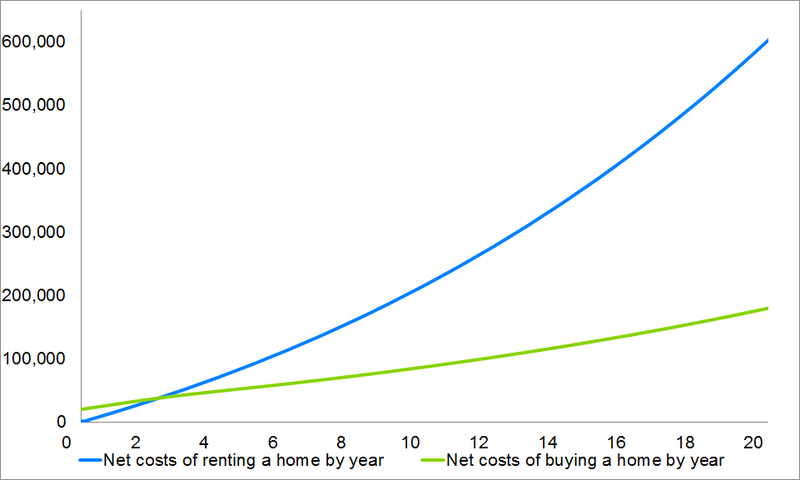 Although 20 percent is a recommended down payment, the graph below shows that even assuming only 5 percent down and a 6 percent mortgage interest rate, the breakeven horizon is just short of four years, and rental costs are still remarkably higher than homeownership costs by approximately $300,000 over 20 years. With 5% down and a 6% interest rate, the breakeven horizon is just under 4 years. 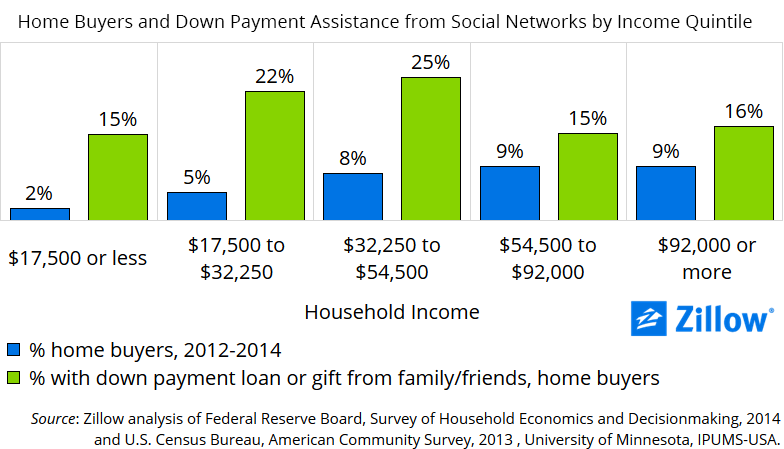 A sign of the times is that first-time home buyers are getting help from their social networks to make the down payment: 22 percent received a loan or financial gift from family and friends. * Of those buyers, 47 percent received an amount between $17,500 and $54,500. * Zillow analysis of Federal Reserve Board, Survey of Household Economics and Decisionmaking, 2014. Nearly half of first-time home buyers receive sizable loans and financial gifts for a down payment. Hi! I recently wished to ask if you happen to have any problems with hackers? up losing several months of work as a result of no data backup. Hi there to every body, it’s my first pay a quick visit of this webpage; this website consists of amazing and truly excellent information designed for visitors.